(1) 55th Legislature - Senate President Pro Tempore, Regular Session, elected 1/8/1957. Senate Journal. (2) 53rd Legislature - Drawing for Terms of Office, 1/14/1953, pp. 16-17. Drew 2-year term. Senate Journal. (3) Not present at organization of the House on 1/9/1945. Oath of office administered on 1/11/1945, pp. 26-27. House Journal. 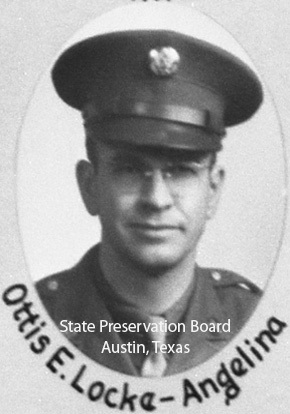 (4) Ottis E. Lock, in special election 7/23/1938, succeeded Samuel A. Jones, Jr., resigned 12/2/1937. Members of the Texas Congress 1836-1845; Members of the Texas Legislature 1846-2004, 2005. 76th Legislature, R.S., SR 744. Resolutions - Memorial. World War II service, Sergeant, "Legislature Faces Problem of Absences: Men in Armed Forces Can't Get Leave to Attend Sessions," 1/1/1943. Dallas Morning News. United States Army, Second Lieutenant. 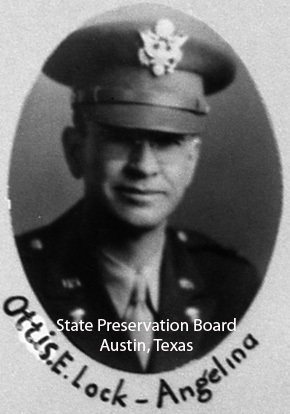 "During World War II, although exempt from military service as a member of the legislature, he enlisted as a buck private in the United States Army and went on to serve his county as a second lieutenant in Army counter-intelligence while continuing his service in the House, having won reelection while on active duty." 76th Legislature, R.S., SR 744. Resolutions - Memorial. Describes Senator Lock's involvement in the political and legislative processes through which the Gilmer-Aikins bills became law. Gilmer-Aikin Bills: a Study in the Legislative Process, 1950.